Protesters and petitioners stood outside the Old Whaling Church Tuesday before special town meeting. 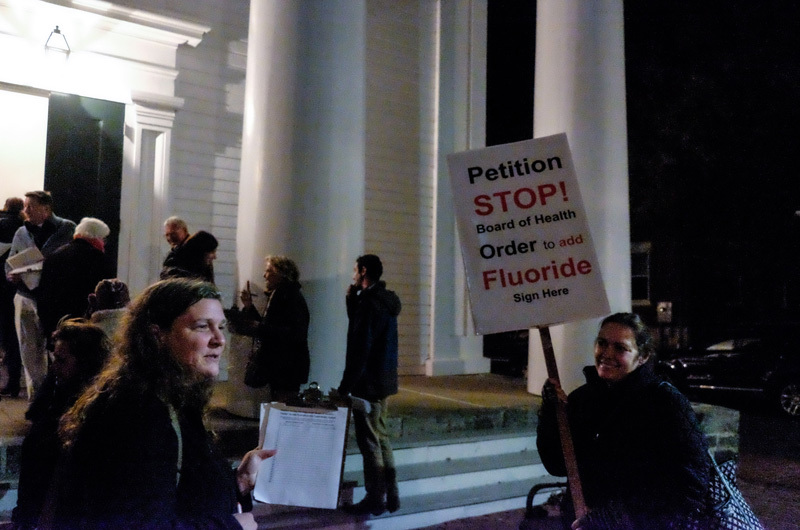 Emotions ran high in Edgartown this week over a recent board of health decision to move forward with a plan to add fluoride to town water. At a meeting Tuesday, members of the water commission and some town residents continued to call for the board of health to rescind its vote, amid heated questions about the process. Opponents are circulating a petition calling for water fluoridation to be placed on the ballot at the town election this spring. Petitioners stood outside the Old Whaling Church before a special town meeting Tuesday to gather signatures. The issue was discussed at a water commission meeting a few hours earlier, which was attended by two of the three board of health members, the town health agent, a handful of residents and selectman Art Smadbeck. The board of health is scheduled to take up the issue again at a meeting next Tuesday. The board voted in October to take steps to fluoridate the town water supply, following a process dictated by state law. Residents have 90 days after notice of the vote to gather a petition, signed by 10 per cent of voters, to bring the issue to a binding town vote. Fluoride has been added to public water since the 1940s to prevent tooth decay. According to the Centers for Disease Control, about 75 per cent of people in the United States receive fluoridated public water. On the Vineyard, Oak Bluffs is the only town that adds fluoride to water. In Edgartown the board of health’s decision sparked debate at a meeting last week. Discussion centered on whether there was another option to bring the issue to a town vote and concerns that fluoridation would go through without town residents weighing in. Health agent Matt Poole and board members Harold Zadeh and Dr. Garrett Orazem have said they are doing their jobs in protecting public health, and that they followed state law and what they thought was the best process to bring the issue to a town vote. Board of health representatives also said they support the petition initiative, saying that their vote to pursue fluoridation was the first step and they welcome a binding town vote. Mr. Poole said Tuesday that the board is waiting for more information from town counsel and the Department of Public Health, though it is clear that the only way to bring the issue to a binding town vote is through the process that board has already taken. He said they would wait to discuss the issue at a meeting next Tuesday, including whether to change course and pursue a nonbinding referendum at the town election. Some who attended the water commission meeting Tuesday heatedly called for the board to rescind the vote. Water superintendent Bill Chapman said he was disturbed by the process. “I think it was a big position to take without consideration of the impact it would have on this board, this department. Your decision was made one-sided,” he said. Water commissioner James E. Kelleher said his concerns focused on the water department. “It doesn’t give us any time to figure out what this is going to do to our system,” he said. “That’s all I care about, is delivering our water. We don’t even know the cost.” He also wondered how fluoride would affect coastal ponds and shellfish. Commissioner David Burke, who has been leading the petition effort, had strong words for the board of health members. “You should be ashamed of yourselves,” said one woman who declined to give her name to a reporter. He said all board of health meetings are public and agendas are also posted publicly. Mr. Poole said the board of health anticipated all along that there would be a petition and vote. In the end the board of health members said they would revisit the issue soon and made it clear they’d had enough. “We’ve taken our licks for 30 minutes,” Mr. Poole said. Some still mistakenly cling to the disproved belief that fluoride helps CHILDREN’S teeth as they form. That hypothesis was thoroughly disproved a quarter century ago. It is important to ask --- exactly why should an ADULT be sentenced to take this toxic chemical, fluoride, in every glass of water every day of life? Fluoridation results in slow poisoning over a lifetime which causes premature ageing, thyroid damage, dental fluorosis, lowered IQ, ADHD, brittle bones (broken hips & arthritis), kidney damage, cancer and other health dangers. Read this excellent book, "The Case Against Fluoride" authored by three scientists, one an M.D. It contains over 1200 scientific references, over 80 pages. So, while 74% of the U.S. is forced to drink fluoridate water, only 5% of the world and only 3% of Europe fluoridate their water. China and Japan have rejected it many years ago. jwillie6 – You can’t get anything right, can you? You can’t even reference your own highly biased, un-reviewed source, the Case Against Fluoride, correctly. It is customary for scientists to count only individual, unique references, and not count duplicate referrals to the same reference – which is a good way to inflate the numbers. There are not “1,200 references (over 80 pages)” as anyone who reads the book can easily discover. The majority of those “references” are not to legitimate scientific research anyway. This opinion piece was published in 2010, so it hardly qualifies as current work in any case. Alison Campbell took the time to evaluate the "references" ~> Search on -- Alison Campbell references-in-the-case-against-fluoride If Connett's book "offers the most complete scientific proof of the ineffectiveness and health dangers of fluoride" then it is quite obvious why he and other anti-F activists have not been able to convince representatives of over 100 national and international health organizations (WHO, ADA, AMA, etc.) that his "over 1200 scientific references (over 80 pages)" should overturn the scientific consensus? The danger of unreviewed "non-fiction" books is that anyone can write them without proving their claims, so often they contain more fiction than would a novel. The bottom line: Fluoridation opponents have not been able to produce any legitimate evidence that fluoridation at optimal levels causes health problems that would outweigh the proven benefits. The "over 1200 scientific references (over 80 pages)" are simply representative of the poor quality studies &/or misrepresentations and twisted conclusions of legitimate research that have been cherry-picked and placed on anti-fluoridation sites and other literature. Quoting from CDC site: "EPA Regulatory Criteria for Fluoride Additives - All additives used by water treatment plants, including fluoride additives, must meet strict quality standards that assure the public's safety. These additives are subject to a stringent system of standards, testing, and certificates by AWWA and NSF International. Both of these organizations are nonprofit, nongovernmental organizations." Yep, force it on us because "it's good for you!" Here's an idea, TRY BRUSHING YOUR TEETH AND CUTTING BACK ON SUGAR! Just another example of government overreach. Don't you have more important things to spend your time and money on? Aren't there any other pressing public health issues that require your attention, maybe an opioid epidemic? What a joke. The reason some other countries do NOT put fluoride in their water supplies include: their water has natural levels of fluoride above what is recommended (China and Sweden, for example); and water supply sources vary widely, so the fluoride is put in salt and/or milk, instead (Japan and Germany, for example). Please don't assume that countries that do not fluoridate their water deem it dangerous. Such ignorance is far more dangerous in the long run as it can lead to greater dental decay, especially for children. Contrary to Steven D. Slott’s statement, water supplies are not fluoridated simply with fluoride ions identical to those which have always existed in nature. Fluorine, F does exist naturally in the environment, however, it exists as a gas, is very toxic and is one of, if not the most reactive of all elements. In fact, fluoridation of water supplies is under taken with one of three synthetic industrially produced chemicals: Sodium Fluoride NaF, Fluorosilic Acid H2SiF6 or Sodium Fluorosilcate Na2SiF6. This information alone, is reason enough to rescind the order to fluoridate our entire municipal water supply and to take some time to responsibly research the methodology, cost, potential impacts, concerns of residents, the purpose and reasons for doing so, and alternative practices.